Chris Chapman was born in Wigan, Lancashire in 1952. 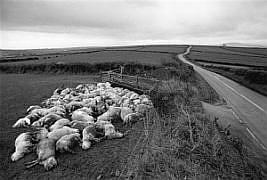 He began his photographic career at the Newport College of Art in South Wales where he was invited to join the Documentary Photography Course run by the Magnum photographer, David Hurn. 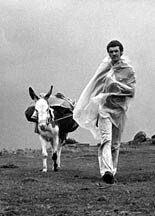 In 1975 he moved to Dartmoor, since when he has documented aspects of Dartmoor life. His photographs reflect traditional skills inherent in the indigenous population and emphasise the accumulation of knowledge associated with age and customs. 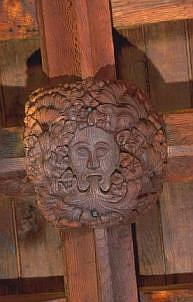 He has a large archive depicting the culture and character of the region. His photography has been widely recognised and is represented in both public and private collections, including those of the Victoria & Albert Museum in London, the Arts Council of England and the International Center of Photography in New York. His work has been published under various titles, including The Right Side of the Hedge (David & Charles), Dartmoor: The Threatened Wilderness (Channel 4) and Wild Goose and Riddon. The Dartmoor Photographs of Chris Chapman. In the early 1990's he worked as presenter and photographer for a new HTV television series, Secrets of the Moor. Each series consisted of six programmes exploring the landscape, history and culture of the differing regions within the South West of England. Exmoor was featured in 1992, The Quantock Hills in 1994, The Somerset Levels in 1996, and The Mendip Hills in 1997. A further series of eight programmes with photography as the central theme, Chris Chapman: On Assignment, was completed in 1998. All the above programmes were produced by the Bristol based television company, Available Light Productions. In July 2000, Exeter Health Care Arts commissioned Chris to produce a body of work for the Tavy Elderly Day Care Ward at the Royal Devon and Exeter Hospital. Following a theme of Positive Views of the Third Age the black and white images are portrayed with excerpts from interviews with his subjects. The project was completed in April 2001 and is on permanent display. In August 2000 the Bristol based television company Icon Films, on behalf of HTV, commissioned Chris to document the Berkeley Estate in Gloucestershire. The estate has been in the same family for over 850 years. A series of four programmes, The Berkeley Estate with Chris as the presenter and photographer, explored life on the estate from August 2000 through to the spring of 2001 including the devastating effects of foot and Mouth disease. In May, Icon Films arranged a presentation at Berkeley Castle, where Chris gave the Berkeley family a leather-bound album containing the photographic record of their estate as it appeared at the beginning of the new millennium. 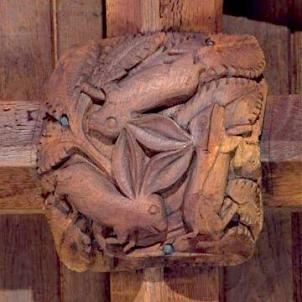 Chris Chapman is also working on a long-term project with Dr Tom Greeves and Sue Andrew of the Dartmoor Society, documenting the medieval triple hare roof bosses that appear in many of Devon's churches and beyond. The Three Hares Project is supported by Devon County Council, the Devonshire Association, Dartmoor National Park Authority, Videotel Productions, private individuals and the Classical Chinese Puzzle Foundation. The first stage of the project is now complete and framed as an exhibition. It was first shown at the High Moorland Visitor Centre, Princetown in November 2001 and subsequently at Devon County Hall, Exeter in Spring 2002. The project is seeking additional funding in order to explore further afield. The book, Wild Goose & Riddon, The Dartmoor Photographs of Chris Chapman was published in October 2000. (Hardback ISBN 1841140902). Celebrating 25 years of photographing the moor this major volume brought together over two hundred pictures with additional text. The book was a runner up in the visual category of the Glenfiddich Food and Drink Awards 2001 and has been widely received. See publications for availability. In Spring 2002 Chris appeared in BBC2's This Land series in the programme Dartmoor and presented a new series for HTV, Chris Chapman's West Country, with Available Light. A two part series, The Tamar Valley for Carlton Television in Plymouth, was broadcast in April 2003. 2005 - Presented a twelve part series on the history of the West Country. How the West was Made was screened on ITV West from May 2006. In the summer of 2005 made his first film for Television, as director/cameraman for ITV West's Westcountry Profile series. Peter Randall-Page: Sculptor was broadcast on 11th October 2005. A second film, Inspirations: Down on the Farm followed in March 2006. Made for Teachers' TV the film followed a seven day visit by Kelvin Grove School, Sydenham to the charity, Farms for City Children at Nethercott, Iddesleigh, Devon. ( In September 2005 Chris was commissioned by the charity to photograph life at Nethercott for a planned exhibition to celebrate their 30th anniversary in 2006. 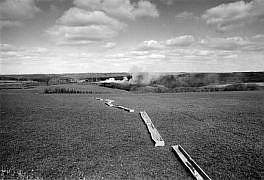 The new photographs were exhibited alongside those of the late James Ravilious taken in the 1970's. Nethercott: a Celebration of 30 Years. Photographs by Chris Chapman & James Ravilious opened at Exeter Phoenix on May 18th 2006. The exhibition Nethercott: a Celebration of 30 Years. Photographs by Chris Chapman and James Ravilious opened at Exeter Phoenix on May 18th 2006. In 2006/2007 Chris presented a six part series, Secrets of the Cotswolds for Available Light in Bristol, which was broadcast on ITV West in the late summer of 2007. He also filmed for a programme on the subject of small schools in Devon for Teachers' TV, in collaboration with Kate King and produced by Available Light. 2008 - new films: 'David Alford Playing the Bones', 'A Fair Deal for the Hills' and 'Dartmoor Farmers'. In April 2008, Chris received an award from The Dartmoor Society for 'his outstanding documentary photography of people and place'. In the autumn of 2007, Chris Chapman and Kate King set up The Dartmoor Film Project to produce an independent film about Dartmoor. Two years in the making, this beautiful film tells the story of Dartmoor through the voices of its people, with contributions from the fields of Geology, Archaeology, Music and Poetry. 2009 - Wild River, Cold Stone - a film of Dartmoor by Chris Chapman and Kate King was launched in July. The making of the film was supported by the Dartmoor Sustainable Development Fund, Devon County Council, Devon Artsculture, Dartmoor National Park Authority, Duchy of Cornwall, Videotel and The Dartmoor Society. See FILM for further details. 2010 - Bovine TB - A Way Forward In October 2009 a neighbours cattle went down with Bovine TB. After filming an interview with the farmer, Chris Smallwood, Chris Chapman secured funding from a number of prominent farming interests to make a short film about the disease. A highly controversial subject, many people believe that had the methodology outlined in this film been taken up, there would have been no need for what is seen as indiscriminate culling of badgers by shooting, and that the farming industry would not be in the crisis it is currently experiencing. 2011 - Ray Exworth - Sculptor A commission from The Ray Exworth WroxhamTrust, this short documentary is about a committed sculptor. One time head of Sculpture at Falmouth School of Art, now in his eighties Ray and his wife Susie live a frugal existence in a small cottage in a remote part of Cornwall. We discover the buildings in the garden are stuffed to the brim with Rays prolific output, and we listen to Ray's philosophy on art. Hope Bourne led a life of self-sufficiency in a tiny caravan in remote isolation in the ruins of a farm on Exmoor for 24 years. Hope fed herself by growing vegetables and hunting for food, so that she could live, she claimed, on less than £1 a week. She spent much of her time painting and sketching the moor, writing a column for the local paper, and combining this creativity in a remarkable series of books. Chris Chapman first met Hope when he was working as presenter and photographer for the six part HTV television series Secrets of the Moor in the 1990s. His admiration and affection for Hope provided the foundations for a friendship which lasted nearly 20 years until her death in 2010. Since then Chris has embarked on a journey of discovery, uncovering his friend's extraordinary life-story in a new 50-minute documentary. "Like so many of her friends, I miss Hope and yet feel her presence on Exmoor wherever I go," says Chris. "As an artist and writer Hope had that rare ability to delve below the surface and reveal Exmoor as it truly is. Her celebration of Exmoor in her books, paintings and drawings is to be revered and I believe will endure." Chris's sensitive and painstaking research has enabled him to see beneath the layers of mythology and misinformation that have shrouded Hope's life to date and shed new light on the story of an extraordinary woman who was both bold and courageous, and whose legacy on Exmoor is greatly revered. "Hope was a fighter in all walks of life and I admired that in her and so was determined with this film to put her story straight," says Chris. "Making the film was difficult at times, but I'm pleased with the result and heartened by people's reaction to it. It brings to life the things that Hope stood for: conservation, farming, hunting, community, freedom and wilderness, but it's not my voice and direction that makes this film interesting, I'm simply the messenger. It's the voices of Hope and the people of Exmoor that shine through."